The Sherman Minton Bridge, which carries Interstate 64 over the Ohio River between southern Indiana and Louisville, Kentucky, reopened to traffic Feb. 17 after emergency repairs were completed two months sooner than originally estimated and 12 days ahead of the most recent scheduled target date. 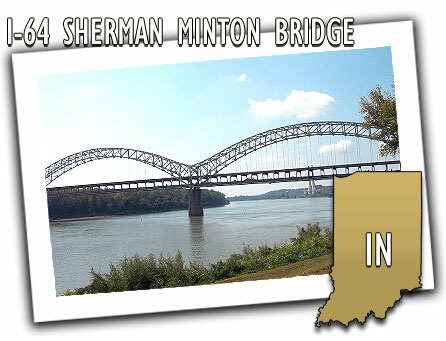 "Thanks to the workers, contractors, and the people of [the Indiana Department of Transportation], the Sherman Minton Bridge is back in operation," Indiana Gov. Mitch Daniels said in a statement. "We've never been happier to pay a contractor incentive dollars for an ahead-of-schedule performance." Daniels acted Sept. 9 to order the immediate closure of the Sherman Minton Bridge after Indiana and Kentucky transportation officials were informed of the discovery Sept. 8 of a concerning crack in the critical load-carrying element of the bridge. (see Sept. 16 AASHTO Journal story) Extensive inspection, testing, and analysis recommended reinforcing the bridge with steel plates, which is anticipated to extend the service life of the bridge at least 20 years. A total of 2.4 million pounds of reinforcing steel was attached, according to INDOT. Indiana maintains the bridge under an agreement with the Kentucky Transportation Cabinet. The two states split the repair costs. Incentives, favorable weather conditions, and efficient work by contractors reduced repairs from an estimated six months to less than four months. It is anticipated that Hall Contracting will receive $1.3 million in incentives for reopening the bridge to traffic early. "It's a relief to have the Sherman Minton Bridge restored and reopened, ready to safely carry thousands of commuters each day," Kentucky Gov. Steve Beshear said in a statement. "Kentuckians and Hoosiers have shown outstanding patience and cooperation during the repair process, and I applaud Louisville-based Hall Contracting for completing this massive project early. The bridge is a vital route for commerce for both of our states, and we welcome its return."